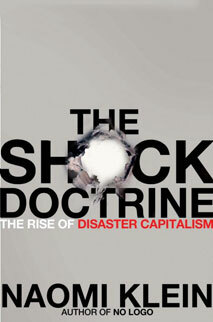 Anti-globalization champion Naomi Klein talks about her new book, The Shock Doctrine: The Rise of Disaster Capitalism. A respected author and columnist, Klein has written three published works including her previous best-seller No Logo: Taking Aim at the Brand Bullies. In this conversation with Dr. Caldicott, we discover what drives Klein’s interest in the corporate and international marketplace, and take a closer look at the “disaster capitalism” taking place around the world. This episode also features an excerpt from the filmnHelen’s War: Portrait of a Dissident, produced by Dr. Caldicott’s niece Anna Broinowski. In the excerpt, you will hear clips of interviews with Martin Sheen, Lily Tomlin, Senator Ted Kennedy and the late Christopher Reeve. This entry was posted on Monday, August 25th, 2008 at 10:32 pm	and is filed under Uncategorized. You can follow any responses to this entry through the RSS 2.0 feed. Both comments and pings are currently closed.